What Are The Top Branding Agencies In The World? What to Learn From Tropicana’s Packaging Redesign Failure? Etihad Airways’ Rebranding – Has it paid off? The Branding Journal is an independent online journal that publishes information and ressources about branding strategies worldwide. The website reports on the importance of branding within marketing strategies and how it empowers companies and shapes consumer behavior around the world. Will Baileys’ new brand extension, Baileys Iced Coffee, grow the brand? What Do You Struggle With in Branding? It is possible to create very unique and unforgettable experiences through the use of smells, and many brands are starting to invest in olfactive experiences in their marketing communications. One such brand is Audi, which recently created the “Love is in the Air” campaign in Spain, based on the sensations transmitted through the air while driving the new Audi A3 Cabrio. Audi chose to use smells to make their consumers relive intangible sensations that transport them back in time, to happy memories from the past, such as spring days, the smell of salt at the beach, and holidays in the mountains. 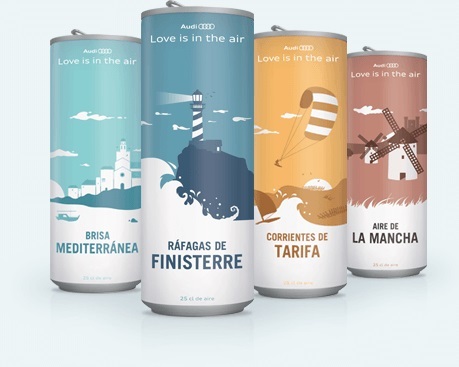 For this campaign, the brand selected a total of four regions of Spain with very special scents: the Mediterranean breeze, the refreshing gusts of Finisterre, the light winds of Tarifa and the air of La Mancha. Each of these scents were captured by the brand and packed into different cans with a minimalist design. The cans are available on the official website for Audi A3 Cabrio www.aireA3cabrio.es. Consumers can order one for free in exchange for a symbolic tweet or post on Facebook. The cans will also be available in special vending machines, which will be available at different summer events across Spain. The use of smell in marketing strategies is called “olfactive marketing”. According to Sensory Marketing, “today, a big part of the research in the sensory marketing field is dedicated to the expansion of olfactive marketing, as it has gained an undeniable importance”. “Human beings have 10 millions oflactive receptors, which enables us to recognize more than 4000 different smells. Our smell memorization is therefore stronger than the visual one”, explains the same source. Marketing professionals use smell as a way to attract consumers, but also as a way to build their brand identity. This campaign is a very relevant and creative way to promote a cabriolet as drivers of convertible cars have the opportunity to experience another level of freedom by feeling the wind on their face and inhaling the scents of nature as they drive through beautiful landscapes. With this campaign, Audi is building new brand cues and encourages consumers to associate the brand with positive olfactive experiences. To finish, by using social media to promote the campaign, Audi also manages to spread its message and considerably reach a large amount of consumers. Marion is the Founder of The Branding Journal. Her passion for strategic marketing made her create The Branding Journal - with the objective to offer an online platform to branding professionals. © 2014-2018 The Branding Journal. All rights reserved.